At its meeting in Grand Junction, Colo., the advisory board recommended that BLM achieve its on-range population goal of 26,715 wild horses and burros while also phasing out the use of long-term holding facilities – both within three years. If Congress allowed BLM to follow through on the independent board’s recommendations, that would mean the government shooting at least 90,000 healthy animals. The advisory board has no power to control policy. The board also called for allowing international adoptions and sales, which have not been allowed before. During its deliberations, the board repeatedly referenced a proposal made by a private party to have American taxpayers pay to ship upwards of 20,000 wild horses to Russia — where they would serve as prey animals for big cats. “Killing tens of thousands of wild horses and burros would be a betrayal of millions of taxpayers who want wild horses protected as intended in the 1971 Wild Free-Roaming Horses and Burros Act and who have invested tens of millions of dollars in their care,” said Neda DeMayo, president of Return to Freedom Wild Horse Conservation. BLM has been close to its Appropriate Management Level before, but the agency balked at using fertility control despite ample evidence that it was safe and effective. 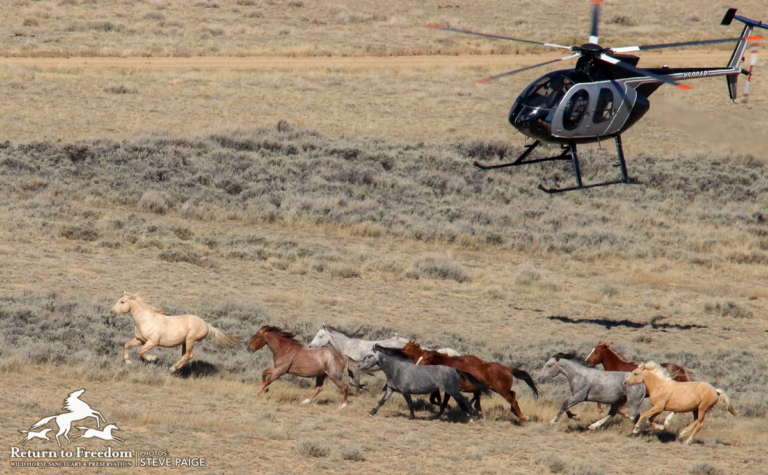 The number of wild horses on the range stood within 1,071 animals of BLM’s own population goal in 2007, yet, even then, the agency chose not to aggressively implement fertility control. In fact, BLM has never spent as much as 4% of its Wild Horse & Burro Program budget on this safe, proven and humane solution for wild horse population control; instead, it spends upwards of 65% of its annual budget capturing, removing and warehousing animals. Return to Freedom’s American Wild Horse Sanctuary was among the first of many projects to use fertility control with great success. It has used the vaccine PZP for 19 years with an efficacy rate of 91-98%. Meanwhile, wild horses continue to be dramatically outnumbered on federal land by privately owned livestock, which graze there at a fraction of the cost that ranchers would pay on private property. Said DeMayo, “A balance must be struck between ranching and mining interests and wild horses and other wildlife as part of a fair interpretation of BLM’s multiple-use mandate on the range. There needs to be a fairer distribution of resources — not more biased reports and recommendations aimed at capturing, removing or killing wild horses. 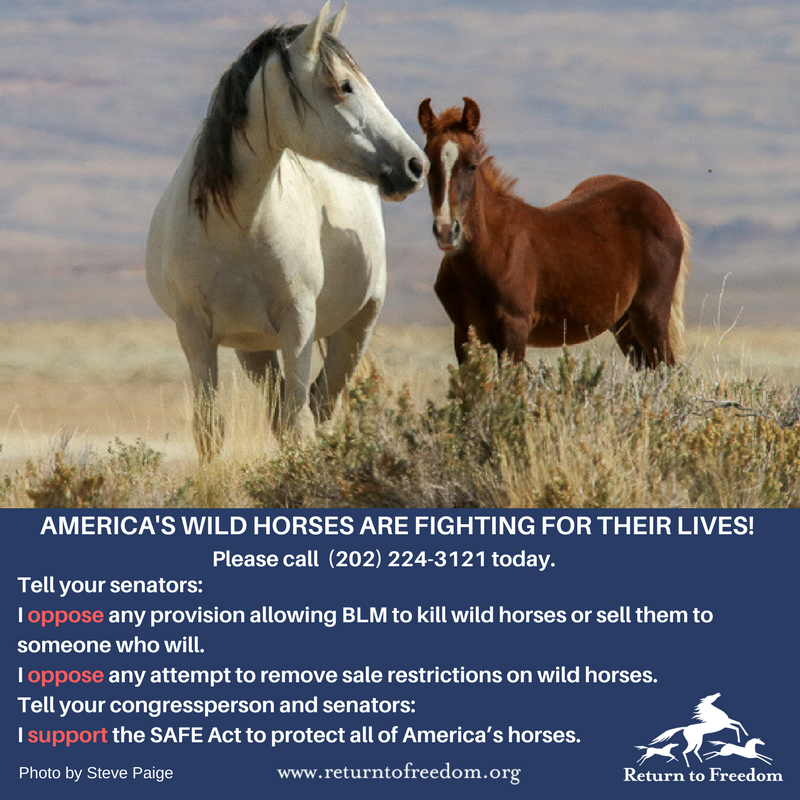 Polls have repeatedly shown that about 80% of Americans oppose horse slaughter and a similar percentage want to see wild horses protected. A March 1 BLM estimate – made before this year’s foal crop — placed the on-range population of wild horses and burros at 72,674. As of August, the agency reported that 44,640 captured wild horses and burros were living in off-range facilities, including 32,146 on leased pastures referred to as long-term holding. On Thursday, wild horse advocate Ginger Kathrens of the Cloud Foundation was the lone dissenting vote on recommendations that BLM achieve “Appropriate Management Level” of 26,715 in three years, close long-term holding in three years, and allow international sales and adoptions. She joined the others on the board in voting to recommend that BLM increase its funding of reversible fertility control to $3 million by fiscal year 2019, up from about $100,000 in 2017. The advisory board’s recommendation would have BLM spend money saved on long-term holding on on-range management and increasing adoptions. Those adoptions would likely spare only a fraction of wild horses on the range or in holding from death. In 2017, BLM has adopted out only about 4,200 wild horses — its best total in years. In September 2016, the advisory board voted to recommend destroying captive wild horses and removing all restrictions to their sale, which would allow buyers to purchase them on the cheap and transport them to Canada or Mexico for slaughter. Again, Kathrens was the lone “no” vote. In July, the House Appropriations Committee approved an amendment to the Interior Appropriations bill that removed language that would bar BLM from killing healthy wild horses. The Senate Appropriations Committee could vote on its version of the Interior bill as soon as next week.